This blog began several months before the publication of Remarkable Leadership – Unleashing Your Leadership Potential One Skill at a Time. While I have continued to write about leadership topics, and plan to for as far into the future as I can see, for a variety of reasons I am changing the blog platform for this writing. All future posts on leadership development, and leadership skill development (as well as ocassional updates about the book itself) will be found on the Unleashing Your Leadership Potential Blog. Which Presidential Candidate Is the Best Leader? There are many criteria we can use to vote for a particular candidate. I’m most interested in one of those criteria – which candidate, Barack Obama or John McCain, do you feel has the strongest leadership skills? 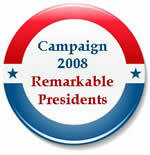 Please share your ideas by voting on our Presidential Leadership survey. You will have the chance to compare each candidate on 12 leadership competencies from Remarkable Leadership. Cast your vote, and request the results which we will share in a Special Report on October 16th, invite everyone else you know to vote as well! I’ll be providing updates and additional information over the next few days. Goal achievement is an important task for us as leaders and we must recognize our role not only as an individual but as a leader. In other words we must be adept at goal achievement, and we must be able to assist, encourage and inspire gaol achievement in those we lead as well. With that dual frame of mind, I hope you will read the the following – that I posted a few minutes ago on my Remarkable Learning Blog. Actually I want you to read it twice. Read it first thinking of yourself. Then read it again with your “leader hat” on. Then when you are finished, determine what action you will take on your goals today and what actions you will take to remind, re-focus and inspire your team to do the same. The risks of this action are few, but the rewards are potentially huge. Goal setting is one thing we all recognize is important, both personally and professionally (even though the vast majority of people don’t set any). Setting goals is one thing, achieving them is something else. If goal setting is the first step in success, persistence is a very close second. Too many people set a goal and feel like the hard work is done. For all of the value of the Law of Attraction, the part that is often overlooked is the Law of Action. Yes, we set the goal and begin to attract it, but attraction comes much faster by taking action. Here is your recipe for goal achievement. Take at least one step towards achieving them each day. Like the stonemason who carves away at the rock with his hammer and chisel, one blow, one chip at a time. Like the Salesman who makes one more sales call each day. Like the athlete who practices everyday. If you want to reach your goals, you must take action towards them. Don’t just ponder and think about hitting a home run when you actually go to bat; go to bat. When you keep swinging you will hit some home runs, but more importantly you will hit singles and doubles. You can achieve many goals with daily singles and doubles. If you want to achieve your goals, be persistent. Take actions everyday that will lead towards the achievement of your goals. If you can accelerate the effort to take many steps each day, your goals will come faster. But if you take consistent, persistent action in the direction of your goals, you will achieve more than you ever imagined to be possible. This quotation isn’t a slam on poems. But the audience of poem readers is (relatively) small. If you have an idea that you want to spread, it must be shared in places where people will see it, hear it, read it and talk about it. How are you sharing it? Don’t hide it, expose it. Don’t whisper it, shout it. Make it real, make it accessible, and make it happen! That was the message of the short keynote I gave last week to Rainmakers, a fast growing, difference making business networking organization in Indianapolis last week. My goal was convince them that everyone is a leader, and that we can all become Remarkable leaders too. They’ve posted the full video of that keynote here. I hope you will take a look and share it with your colleagues and fellow leaders.